Politics • Democrat Smith says lots of voters are undecided and claims he's got the momentum. 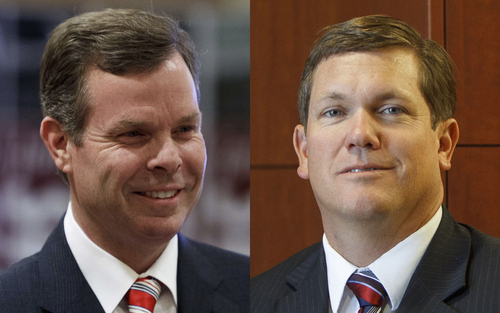 Utah Attorney General candidates John Swallow, left, and Dee Smith. He knows what it is like to lose close races, having done so twice in congressional campaigns against Rep. Jim Matheson. But now Republican John Swallow appears on track for a landslide win in his bid to become Utah attorney general  with a 2-1 lead in a new poll. He is favored by 56 percent of likely voters, compared with 27 percent for Democrat Dee Smith, 7 percent for others and 10 percent who are undecided, according to a Mason-Dixon Polling & Research poll conducted for The Salt Lake Tribune. "We&apos;re absolutely thrilled with those numbers," Swallow said. "But we&apos;re not taking anything for granted, and we&apos;re going to keep working hard through 8 p.m. on Election Day" when polls close. "If the numbers hold, we&apos;ll have a nice victory Tuesday night." Smith, the Weber County attorney, issued a statement saying he&apos;s still in the race to win. "Our numbers show a much larger number of undecided voters. With the momentum clearly on our side, we feel that the voters of Utah do not want the Attorney General&apos;s Office to become even more politicized than it already is," the statement said. "We believe that we will be able to carry that momentum to win on Tuesday." Swallow said his lead in the poll comes "hopefully because voters know me" through his "involvement in some high-profile cases" as chief deputy to outgoing Attorney General Mark Shurtleff, serving six years in the state Legislature, and his other political runs  including close losses to Matheson in 2002 and 2004. In 2002, he lost by a razor thin 49.43 percent to 48.69 percent margin. Brigham Young University political science professor Kelly Patterson agrees that Swallow "is no newcomer" to voters, and adds that his name recognition among voters was also likely helped by a fierce battle he had in this year&apos;s Republican primary election with Sean Reyes  which Swallow also won by a 2-1 margin. Smith is less known statewide, despite involvement in some high-profile Weber cases, including the ongoing prosecution of Matthew David Stewart, who is accused of killing a police officer. But Patterson said Swallow is likely benefitting even more because he is a Republican in a heavily GOP state. "That&apos;s the kind of distribution you expect" in poll numbers in a state that is as lopsided by party as Utah, he said. Several poll respondents said in interviews that they didn&apos;t know much about either candidate  and simply chose to support the candidate from their own party. The trouble for Smith is that Democrats are outnumbered in Utah. "We vote straight Republican, and that&apos;s all we need to know," said Janice Muir, of Salt Lake City, adding she didn&apos;t know much about Swallow. But, she said, "We support conservatives." Similarly, but for the opposite party, Theresa Vankanten, of Grantsville, said, "We&apos;re voting Democratic." She said she had read a little bit about Smith and feels he has some good ideas. But she really wants "to turn Utah into a blue state," and that is the main reason she is voting for all Democrats. Some issues have created heat in the campaign, such as when Swallow and Smith battled in a debate over payday loans. Smith called payday loans predatory and said more should be done to protect desperate people who become trapped by their high interest rates. The dig targeted Swallow as a former lobbyist for the payday loan industry. Swallow said people should have the right to obtain loans where they wish. The statewide poll interviewed 625 people between Monday and Wednesday. Its margin of error is plus or minus 4 percentage points.